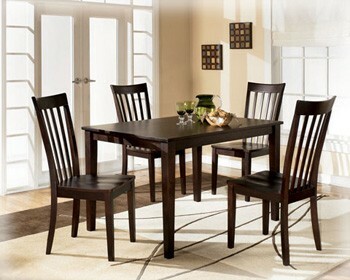 Lease this beautiful Dinette for only $11.99+Tax Weekly or $48.00+Tax Monthly. Purchase Price is Only $429.99+Tax or Take advantage of our 90 Day Same As Cash Program! 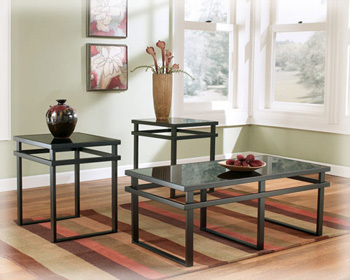 Lease this 4pc Bedroom Furniture Set for only $18.99+tax Weekly or $76.00+ Tax Monthly. Purchase this 4pc Bedroom Furniture Set for Only $749.99+Tax or take advantage of our 90 Days Same As Cash Plan. Add a Queen Size Mattress Set for $15.00+Tax Weekly or $59.99+Tax Monthly. Purchase the Mattress for only $589.99+Tax or take advantage of our 90 Days Same As Cash Plan! With an exciting contemporary design featuring contrasting finishes, the “Maro” TV stand adds an artistic style that is perfectly sure to enhance the decor of any living room environment. The replicated black paint is perfectly complemented by the satin nickel color finished edges giving this TV stand a sleek style that perfectly captures the essence of great contemporary design. With the tapered shape and open shelf design, this piece has the sculpted look of fine artistic furniture that will capture the attention of anyone within your living area. Awaken your home’s decor with the sleek sculpted contemporary design of the “Maro” TV stand. 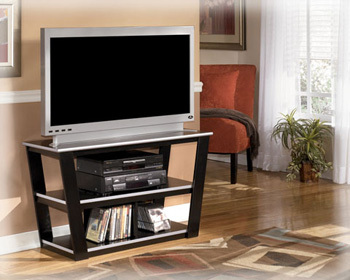 Lease this item OR add with a TV/Home Theater System for $3.99+tax Weekly or $16.00+tax Monthly. Cash Price $159.99+tax – Buy or Lease through our 90 Days Same As Cash Plan. Lease this item or add on to Living Room Furniture for $5.99+Tax Weekly or $24.00+Tax Monthly. Purchase Price $239.99+Tax or get it today and use our 90 Day Same AS Cash Plan! Get Half OFF your First Month Lease Payment or Add on to Living Room Furniture and receive $50 Off your First Month. Previous post: Premier Rental Purchase: New Year, New Look Sale Coming to An End Soon!